Yekadasha Rudra Homa is a procedure in which eleven forms of Rudra are invoked and worshipped. Homa consists of two sections the Namakam and the Chamakam. Namakam is a prayer to Lord Rudra to forego his ire and shower his benevolence. While, Chamakam is a list of Ishtakamyas (desires) that need to be fulfilled by Lord Rudra for a happy, healthy life. 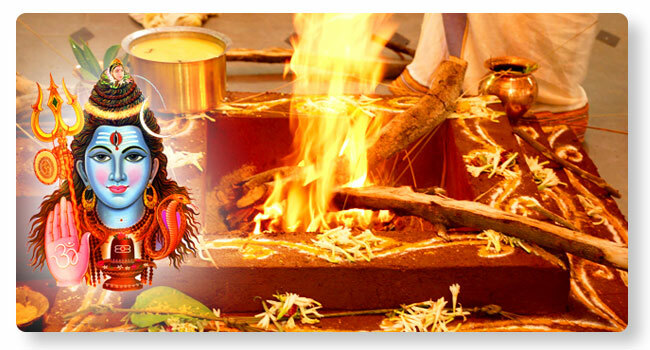 The main objective of Yekadasa Rudra homa is protection against the negative thoughts and grant of desires. Eleven forms of Rudra are invoked and appeased through ‘HavyaVahana’ (Agni) who delivers the Homadravya to Lord Shiva.